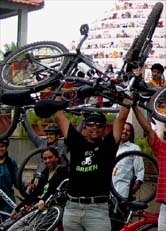 GoGreen Cyclothon_event 11 Oct 2009 - GGI-Group size: 4000+ Professionals, Increasing on day to day basis, Come & join us 2 serve Mother Nature. 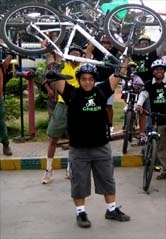 32 Members of Go Green team participated in the Cyclothon Event, Most of them were among the Green Ride, few on Amateur & few on Elite ride too.. Much before we reached the BIEC the first Elite ride was already flagged off.. We took around 1 Hr to settle down most of it was due missing guidance or announcements however it was a quite a big event. Most of the place was filled out with MSG candidates on hired BSA Hawak. 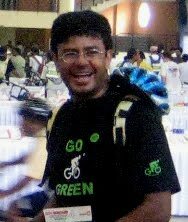 Shantanu along with his cycle was present @ BIEC by 6:00am and has not registered to any of the rides. Soujayna had missed BMTC bus from Koramangala but manged to reach venue with her husband's help. Our Green Ride started @ 9:30am. It was little cramped in the beginning but going forward once we hit the NICE road people got distributed. Vasant Kumar & Nishank caught us @ the entrance gate where we all shouted them to join and the security guy who was petrolling was confused as both of them were also wearing the Go Green Tee's and allowed them to join with out BIB no. :). In the beginning, We started as a Fun ride and hence were in group discussing shooting couple of snaps but very soon we realized every one were overtaking us hence myself, Rajaram,Pradeep & Vijay decided to split from the group and Race on to be in the first positions. Very soon we achieved and maintained till the end point. I didn't clocked the watch but I feel we completed 25 Km within 50 Min. Nice experience. More details about the event & results. The 35-km competition called Elite was for professionals, competitive athletes and amateurs. The other events were Corporate Race (25 km), Green Race (25 km), Teen Ride (13-17 years, five km), and Fun Ride (8-12 years, two kilometres).The men’s 35-km Elite race was won by Sabu Ganegar, a 19-year-old currently getting trained at the national camp in Patiala. 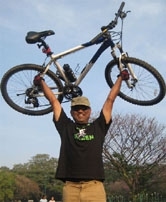 The second place was bagged by rider Sachin Panwar of Delhi. The third place went to Sharwan Bambu of Rajasthan. In the women’s 35-km Elite race, the first place was won by K. Suchitra Devi who is also getting trained at the national camp in Patiala. The second and third places were won by Nilanmma Maligawad of Karnataka and Mahita Mohan from the national camp. Along with participants from all walks of life and belonging to age groups from eight to eighty years, the event also had a good dose of celebrity presence, including popular Kannada actress Pooja Gandhi and billiards champion Pankaj Advani. Few Snaps taken during the event. Feedback/update on the cyclothon event by our group member. Great being a part of the cyclothon held in the city.